Regent students volunteered at D-Now this weekend, March 29-31 at Discovery Church, converting many youth to Christianity and providing a weekend of fun for them. On any other weekend, Mary Flannery can be found with her three grandchildren and other family; but this weekend, she was a planning fanatic, working with other volunteers to plan a fun-filled weekend for teenagers. Discipleship Now, or D-Now, is a three-day weekend retreat where kids come to worship, help the community, and make new friends. Kids sixth through twelfth grade can attend, enjoying free food, a host home where they sleep for the weekend, and special surprises like nitrogen ice cream. The event had approximately 55 volunteers who helped as small group leaders, kitchen staff, event coordinating and more. Small group leaders are typically young adults who help to teach and guide the students in a role-model way, leading by example. Keynote speaker Asa Lowe spoke to the group about needing Jesus and the importance of sharing Jesus with the world. Danielle Ngo, Flannery’s daughter, and her husband Andrew Ngo were part of the worship band that played for the weekend, making an impact on the kids through their music. 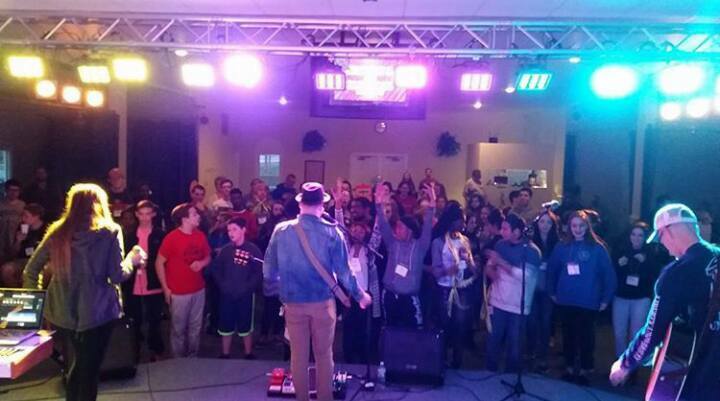 The kids impacted the band with their enjoyment of the worship music. On Saturday, the youth and volunteers headed out into the community to help those in need. The weekend of mission projects and worship seemed to bring the group together, some of them already looking forward to what next year’s D-Now has for them. Anyone interested in volunteering in future years should message their Facebook Page.